No matter how one chooses to mark the end of the Cold War, it ended a long time ago. The Berlin Wall fell on November 9, 1989. The Soviet Union itself ended on December 26, 1991. Yet in many ways, various global institutions and the way the world is organized was still very much along the Cold War lines. Various forces have been pressuring this arrangement, and US Trump is the first American President to offer an alternative vision. This vision is most assuredly not isolationist, though many pundits continue to use this term. The fact of the matter is that, according to the Eurasia Group, US special operation forces have carried out missions so far this year in 133 countries or more than 2/3 of the UN members. Trump does not want to withdraw into a Fortress America. He wants America to reap a share of the world economy that is commensurate with its economic prowess and has little time for ideological and institutional constraints on its freedom of action. Before the Russian Revolution (1917), rivalries between the UK, Germany, France, and Japan were carving up the world, including China. The US got into the competition of the Great Powers by grabbing pieces of the weakening Spanish Empire and took its first and only formal colony, the Philippines, as well as some small islands that would serve as coaling stations to allow the US to project its power and trade to the Asia Pacific. The Cold War is over. That should end the ideological conflict and the institutional expressions. It is true that Russia has nuclear weapons and that is what gives it a seat at the table. It does not even pretend to have ideological differences with the US or Europe. It is about power and influence. Russia has metals, energy, and grains to trade, but it is not an economic rival. In fact, the longevity for males is lower in Russia than in North Korea. If capitalism vs. communism is no longer the main division in the world, then economic rivalry becomes more salient. The America First that Trump speaks of is not about the America First committees that sought to keep the US out of WWII. Rather Trump's reference is to the America First of Harding, who followed Wilson and rejected the League of Nations and Wilsonian multilateralism. Trump wants to alter the terms of the world order in the US favor, using military and economic levers to impose its will on others. There have been calls for a new Bretton Woods. That is the liberal internationalists' solution. Trump's solution is to reinvigorate America's presence, and offer a more robust defense of US national interests understood chiefly in transactional economic terms. There are joint, and distribution gains from trade and Trump insists that the US share of those gains increase. The kind of multilateralism, which means limits on the US ability to pursue its national interest that the Cold War entailed are no longer needed. There are some longstanding complaints about Europe, for example, like military spending, non-tariff barriers to trade and the like, that American leaders have often discussed but have not pressed as hard as Trump. 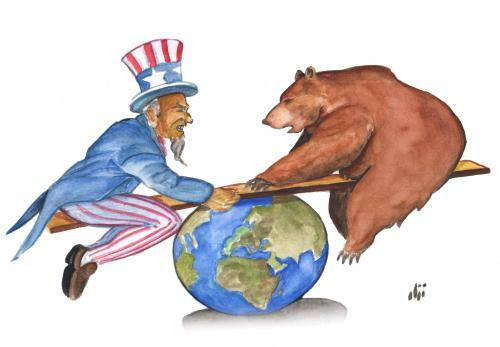 The so-called traditional security alliances, like NATO, is not needed it Russia does not pose the threat it once did. There is a certain realism expressed. As opposed to Wilsonian idealism, which in George W. Bush's national security strategy was expressed as the desire not just to make the world safer but better, Trump is primarily and maybe exclusively interested in economic well-being. He shows little interest in human rights promotion or advancing democracy. Three major factors that explain the dollar's role in the world economy. First is inertia, like our QWERTY keyboard, it is there. An alternative would have to be better not just as good. For many decisionmakers, holding on to dollars is less complicated than shifting to something else. At present, and for the foreseeable future, there is no compelling alternative. Second, the key to the dollar's role does not stem from the fact that oil is denominated in US dollars. The role of the dollar is made possible by the depth, breadth, and transparency of the US Treasury market, which is where the dollars in reserves are primarily invested. No other bond market that can fulfill the function of US. The privilege that accrues to the US is not the lowest interest rates, as US short-term rates have never been this high relative to Germany (two-year) for example. Japan and Germany, for example, have negative interest rates and not only at the very short-end that be set by central banks, by intermediate bonds as well. Despite two percent inflation, a robust economy, and a strong conviction that ECB bond buying will be finished at the end of this year, the German yields are negative out six years. Japanese yields are below zero through eight-year maturities. Swiss yields are negative through ten-year tenors. Third, some recent academic work suggests that the military protection that the US offers many countries may also support its role as a reserve currency. Trump seems to place less emphasis on this consideration. Even though, for example, Montenegro has troops in Afghanistan and has been a target of Russia's asymmetrical warfare in allegedly supporting a coup as a NATO member, Trump has expressed dismay that the US would be obligated to defend it under Article 5 of NATO treaty (only invoked once in its history, and that was in response to 9/11). Even before the Trump Administration, some in the US Treasury Department had become more ambivalent about foreign officials buying US bonds. On the one hand, foreign buying of US bonds was needed to fund the US current account deficit. On the other hand, by purchasing US bonds, foreign central banks were resisting the upward pressure on their currencies, which ostensibly, was preventing the trade account from adjusting. The view that had already been expressed by some in Obama's Treasury that foreign countries should "buy US goods, not US bonds." The relationship among great powers, if the ideological conflict is de-emphasized, increases the salience of economic competition, and these were becoming more important before 2016. Trump has provided some answers. It may be muddled and poorly articulated, but there is an underlying coherence that ought not to be lost on investors. It is not just the Trump Administration that is re-imagining global competition in the post-cold war era. Russia is not content with the territorial settlement. China has prospered like few other countries over the past 40 years but is chaffing under what it sees as a unipolar world. All three great powers are not content with the status quo. It will change, but without a compelling alternative, the dollar's role seems secure for years to come. The US could abdicate. It could make it more difficult for foreign investors to access the US debt market. Some suspect this is what the US is doing by politicizing access to the dollar funding market, for example. The imposition of capital controls would be a major step toward abdication, but we see no sign whatsoever that is being considered. Yet, if the US insists on pursuing a narrow sense of its self-interest, investors will continue to be on the lookout for alternatives.